Bermuda bus routes all originate from the central bus terminal at Hamilton City which is the capital and the main commercial hub of the island. All buses therefore start from the Central Bus Terminal at Hamilton City, reach out to different destinations within the island and then return to Hamilton City. The only exception is bus route #6 which operates between St. George's Town and St. David's Island at the eastern end. From Hamilton City, some routes go towards the western parishes, while some towards eastern parishes. Few short routes however cover only the suburbs around Hamilton in the centrally located Pembroke parish. There are total of 11 bus routes in Bermuda and they are spread across 14 bus zones of approximately two miles each. 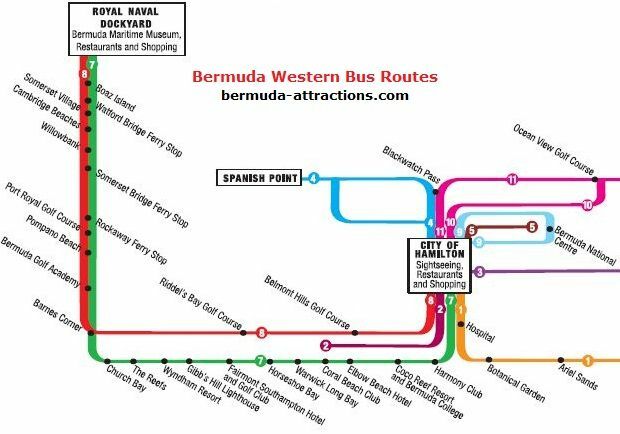 If you are traveling between Hamilton City and the western parishes like Warwick, Southampton, or Sandy's (including Royal Naval Dockyard), you should look at the map below showing the Western Bus Routes of Bermuda. The central routes (#4, 5 and 9) each covers a part of Pembroke parish around Hamilton. 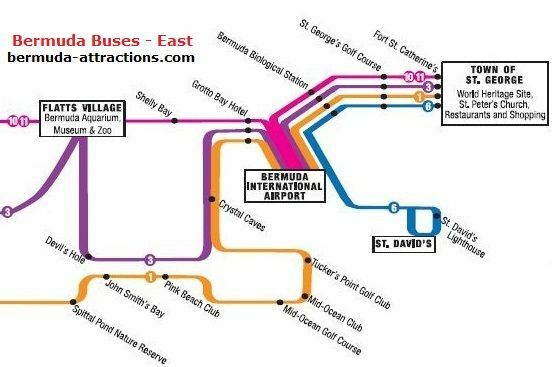 As you can see in the map above, there are essentially two main bus routes (#7 and 8) that start from Hamilton City and go all the way up to the Dockyard (Kings Wharf port area) at the western tip of Bermuda. Route #7 goes along the south shore (by South Road) and you get a wonderful view of the south shore beaches. Route #8 takes the Middle Road and you get nice views of the parish landscapes. Both these routes finally merge at Barnes Corner located near the western end of Southampton. It takes approximately 1 hour of travel between Hamilton City and the dockyard by bus. Bermuda Underwater Exploration Institute (Hamilton), Botanical Gardens / King Edward VII Hospital, Coco Reef Resort, Elbow Beach / Elbow Beach Hotel, Coral Beach Club, Warwick Long Bay Beach, Horseshoe Bay Beach, Fairmont Southampton Hotel, Gibbs Hill Lighthouse, The Reefs Resort, Church Bay Beach, Barnes Corner, Bermuda Golf Academy, Pompano Beach Club, Hog Bay Park, Port Royal Golf Club, Rockaway ferry, Somerset Bridge / Fort Scaur, Cambridge Beaches / Somerset Long Bay, Somerset Village, Dockyard (Kings/Heritage Wharf). Bermuda Underwater Exploration Institute (Hamilton), Belmont Hills Golf Course, Paget Marsh, Warwick Pond, Riddel's Bay Golf Course, Barnes Corner, (then same as route #7). NOTE: Some services on these two routes do not serve the dockyard and rather terminate at Barne's Corner and return. There will be a display in front of the bus indicating the final destination. The other short route #4 originates at Hamilton Bus Terminal, goes up to Spanish Point in Pembroke and returns. Some services of this route takes the North Shore Road (the upper blue line of route #4) and others go via St John's Road (the lower blue line on the route). This is the shortest of all routes. It goes from Hamilton to Pond Hill in Pembroke via Glebe Road (10 minutes one way). This route is used mostly by local residents. This is a curricular route in Hamilton/Pembroke area and covers Bermuda National Stadium, Cedar Park, Palmetto Road etc. The average circular run time of this route is 10 minutes in either direction. To travel from Hamilton City to places in eastern parishes like Devonshire, Smith's, Hamilton Parish and St George's, you should look at the following route map. When you come from the Dockyard to Hamilton City by ferry to take an onward bus for places like the Aquarium, Crystal Caves, John Smith's Bay, St. George etc, you should walk down to the Central Bus Terminal at Washington Street and take the bus (you can however get bus#1 on Front Street itself at BUEI). To get to the bus terminal from the Hamilton Ferry, walk down along Queen street, take a right on Church street and you will reach the crossing with Washington Street. The main bus terminal is few steps from there and about 350 meters from Hamilton ferry. It takes only 7-8 minute walk from Hamilton ferry terminal. As you can see in the route map above, bus routes #1, 3, 10 and 11 all go from Hamilton City right up to St. George's. The only difference is that bus routes #1 and 3 go through the lower part (Smith's parish) while #10 and 11 go through the upper part of Bermuda (north shore and Hamilton Parish). If you are heading directly for St. George's, then 10 & 11 will be faster. It takes roughly an hour to travel between Hamilton City and St. George's by bus. BUEI (Hamilton), King Edward VII Hospital, Botanical Garden, Spittal Pond, John Smith's Bay Beach, Pink Beach Club, Mid Ocean Golf Club, Tucker's Point Golf Club, Crystal Caves, Swizzle Inn / Blue Hole Park / Grotto Bay Beach Hotel, International Airport, St. George's. Arboretum, Flatts Village, Aquarium, Crystal Caves, Swizzle Inn / Blue Hole Park / Grotto Bay Beach Hotel, International Airport, St. George's. WER Joell Tennis Stadium, National Sports Center, Ocean View Golf Course, Flatts, Aquarium, Shelly Bay Beach, Swizzle Inn / Blue Hole Park / Grotto Bay Beach Hotel, International Airport, St. George's. This route operates between St. George's Town and St. David's. It serves Carter House, St. Davids Light House etc. Some services also serve the Clear Water Beach. One way run time (St. George to St. Davids) is 25 minutes. I want to buy a booklet of tickets but not sure if I need 3 zone or 14. zone. For instance, after taking the ferry, we will travel from St George or Hamilton to Tom Moore's jungle. How can we tell how many zones that is? Is there a place that tells us? Thank you for your help. When you pick up the time table from a Visitors Information Center, it also shows you the zone boundaries on the backside. However that only gives you a rough idea and you may not always know clearly the number of zones between two exact points. Usually if the travel is short and limited within about 2 miles, then it is a 3-zone travel, otherwise 14-zone. So better to ask at the counter while buying the ticket booklets, and the staff at the counter can help you with ticket booklet depending on your travel plan. With that said, your travel plan will require 14-zone tickets (including in the ferry). If you plan to travel around in the island, it's wise to buy book of tickets for 14-zones instead of restricting the travels for few dollars. 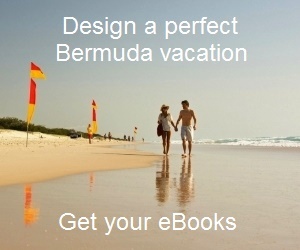 I'm bringing my 11 year old granddaughter to Bermuda next week. Arriving at Kings Wharf Dock. Day 1 planning to take ferry to St Georges, then St Peter's, Unfinished Cathedral, Caves and Aquarium. Can I get bus to get to all these sites and then take ferry back to boat from Hamilton at end of day? Which buses and how do I find them? Day 2, hoping to take ferry to Hamilton and walk or take buses to Cathedral, Post Office, Government buildings and Underwater Exploration Center - as well as lunch at the pub and a visit to the English Shop. Where do I find buses, or can we walk to everything. This is a big trip for us and I want to be prepared to get around and not waste time looking for buses etc. Thank you so very much. Within St. George, best is to walk. There is minibus service to few places though (available from Kings Square area). From St George take bus #1, 3, 10, or 11 to the caves. Then bus #10 or 11 to Aquarium, then continue on same buses (#10,11) to Hamilton city. Take the blue route ferry back to dockyard. Within Hamilton, you can walk around and visit the places. Hello, I was in Bermuda in 1986 and had strawberry shortcake every morning at the Fourways. Yummy! In October 2015 I will be in Bermuda for 3 days, sailing there on the Carnival Splendor, docked at King's Wharf. Can I take a bus from there to the Fourways? It's at #1 Middle Road. Thanks in advance for your help. Hi, you can take bus #8 from the dockyard to Fourways Inn.